We have a couple boys around here that are really fixated on certain things. Scratch that, all the boys. 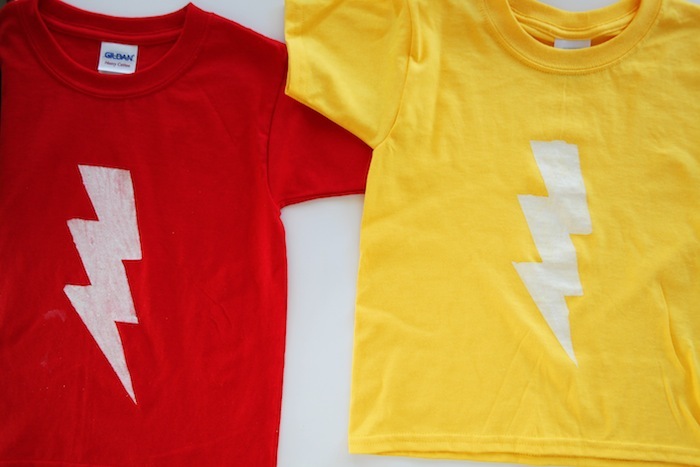 We all know Dash’s love for superheroes. The Rammell Brothers have really taken to Legos as of late, and Hayes won’t wear anything but the color red. For his birthday he asked for red pants, red shirts, red belts, red socks etc. etc. Boys sure are loyal! So, we’ve really loved being able to whip up quick DIYs for their clothes for when these passions strike. 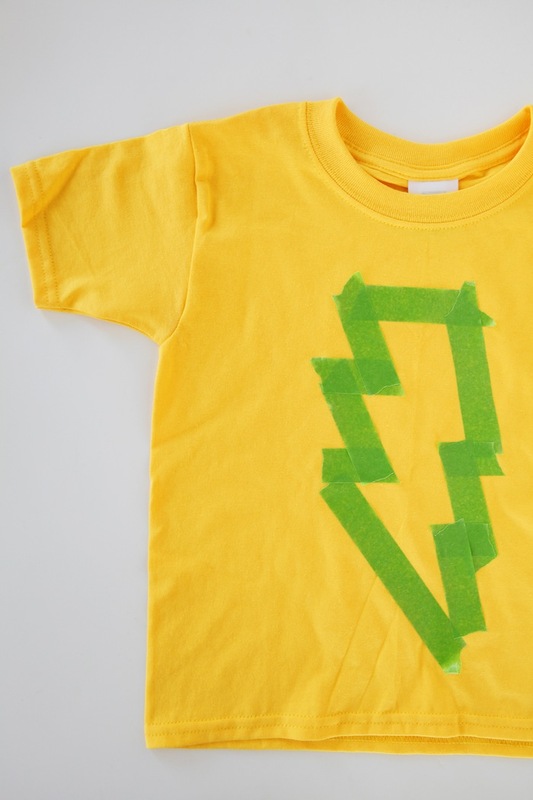 Here’s a super quick DIY to dress up their favorite color, to satisfy their favorite heroic symbol, and you can make one for everyday of the week for $20! Cotton T-shirts (Wal-Mart has these for $3! 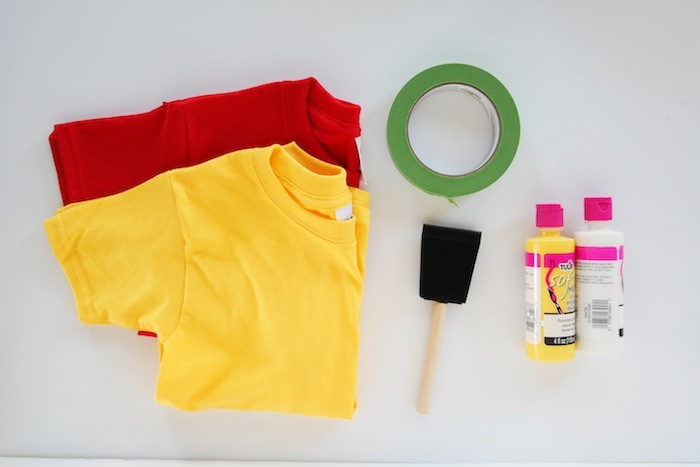 ), Painter’s tape, a foam paintbrush, and acrylic or fabric paint (acrylic works and washes up just as great as fabric!) The last time we did a DIY like this a few readers said “HELLO! Use freezer paper, its so much easier!” But guess what? We’re not that fancy, today. We hope you’ll still be our friends. Tape off the desired pattern. We also did a test to see which painter’s tape was better, blue or green. Green, although a bit more expensive, keeps the most crisp edges and is wonderful for projects like this! You can print off the image, cut it out and tape around it, but again, not that fancy today: eyeballin’ it. Then, you’ll be ready to paint! 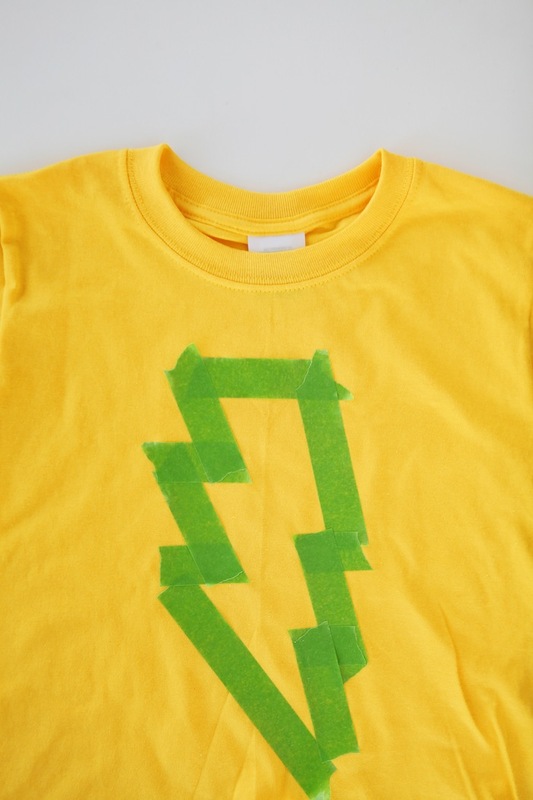 But first, stick in a sheet of cardstock, scrap cardboard, or something to protect the other side of the shirt from excess paint. An 8×10 sheet of paper is usually plenty for kid projects like this. Then take your sponge brush and paint away! Wait just a moment, and then remove the paint. We’ve had issues letting it dry and then moving the tape, sometimes it pulls paint up with it! So, remove the tape, let it dry completely with the paper still inserted in between and then you’ll be good to go! 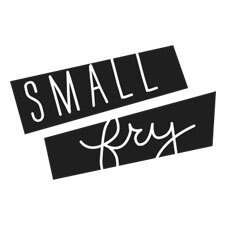 Thank you to Jylare Smith for being our contributing photographer this month! Follow her on Instagram (@jylaresmith) to see her California, Washington DC, Utah and Idaho shooting schedule!